Even someone who would consider themselves a professional can enjoy taking a sewing class from time to time. 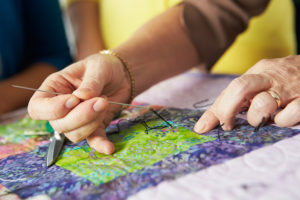 These sewing classes offer everyone the opportunity to make new friends within the area who share the same hobby or profession, learn a few new techniques, or receive a helping hand on their current project. Whatever your reason for visiting our class, know that we offer the best sewing classes around Bloomington, IL, hands down. Sewing Center currently offers one of the most comprehensive equipment lessons for our customers with each purchase of a brand new sewing, embroidery, or quilting machine. When you buy a new piece of equipment, we include an instruction book within the box, but even this can be confusing to many consumers these days. We take things a step further by offering an advanced rundown of the piece of equipment you have purchased, how to use it effectively, and anything else you may need to know before setting things up and working in your own time. These lessons are completely free when you purchase a new sewing machine from us, so take advantage of the offer! Along with our equipment lessons, we currently offer numerous classes and events to help improve your skills. We host each event in an effort to teach our wonderful clientele a little something about sewing. Our classes also focus on embroidery, quilting, the machinery being used, or materials that we may have available for them. You can meet like-minded individuals of any age and skill, and just enjoy yourself in your free time. It is a fun way to spend your time off from work, we promise! If you are interested in taking one of our best sewing classes near Bloomington, IL, stop by! Alternatively, if you want to purchase a sewing machine, we urge you to visit us as soon as possible!